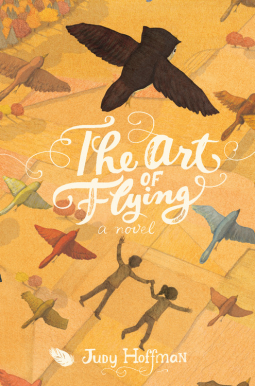 I could not put this book down. Aside from the intriguing premise–what would we do if water suddenly became a scare commodity?–I found the characters to be believable, flawed, and empathetic. The plot is a tapestry of both tension and moments of tenderness, with several believable plot twists that I didn’t see coming. 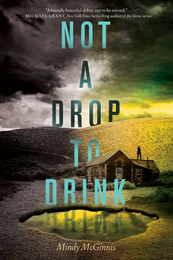 I would hand Not A Drop to Drink to both boys and girls; with the survival elements and light (very light) romance, this book should have wide appeal with teens. Publisher’s description: Regret was for people with nothing to defend, people who had no water. * wants (or doesn’t mind) books that have elements of light romance, yet doesn’t want (or need) romance to dominate the plot. * Environmental Issues–Although the reason for the water shortage is never explained, this story is sure to spark discussions of resource conservation within the context of global warming and rising pollution levels. * Human Nature--At which point does our survival instinct overcome empathy and charity towards others? Government policies and main character Lynn’s believable shift in her world view will make excellent fodder for classroom discussion. *Types of Conflict–Lots of examples to choose from in this story–character vs. character, self, society, and nature. *Text-to-Text Connections–Pair this with Melanie Crowder’s Parched and Linda Sue Park’s A Long Walk to Water, as well as Mike Mullin’s Ashfall trilogy. Click here for reviews and here for the author’s website.